My daughter asked her dad this question one morning before school. When my husband replied that ghosts aren't real, she quickly responded, “My friend says that ghosts are dead people that come back to life.” Every year beginning around the end of September we engage in this battle. My kids’ friends love this time of year. However, I realize that October 31st is more than just a fun night out. It reinforces the daily spiritual battle we as Christians and as leaders of our homes face. Many Christians wrestle with whether or not to participate in Halloween. Some refuse to allow Satan to take the glory for himself and seek to glorify God. Others avoid the events altogether, clinging close to Bible verses such as 2 Corinthians 6:14: “Do not be yoked together with unbelievers. For what do righteousness and wickedness have in common? Or what fellowship can light have with darkness.” Either way you choose, make sure you are at peace with yourself and with God. Knowing what the Bible has to say about the paranormal can help educate your children on what’s right and wrong about the dark side. Many people (including Christians) are confused about whether or not ghosts are real and if what is glorified in TV and movies is a part of the spiritual realm or just a fabricated story. Yet, the Bible speaks clearly about the paranormal. Although exactly what goes on in the spiritual realm remains a mystery, we can educate our children on the truth about ghosts, zombies, and the afterlife. Use Halloween as an opportunity to make your kids more aware of what the word of God says about this (and many other current issues). Deuteronomy 18:10-11, Luke 24:39, and Romans 8:38 are great places to start. If you do go out trick or treating, be intentional about meeting some neighbors along the way. As you wait for your children to ring the neighbor’s bell, strike up a conversation. We met some new neighbors a few years ago when we bought our first house. Because of that meeting, my husband officiated their wedding ceremony and we have been friends ever since. God is a God of redemption. This includes a day that celebrates the occult. Instead of dreading the day (as I have done in the past), see it as an opportunity to meet people you would never meet otherwise. Can you imagine the celebration in heaven if the people you met on a day intended for evil resulted in someone’s salvation? You don’t have to slam a Bible over someone’s head to impact someone’s life. If you give out candy, attached a piece of paper to it with a Bible verse. “Taste and see that the Lord is good” (Psalm 34:8) is a great verse, as well as Proverbs 16:24 and Psalm 119:103. Also, let the neighbor kids know that if they ever feel unsafe at any point in the night (other kids harassing them, they get lost, etc.) your house is a “safe house.” Reassure the kids that they can come to your house and stay there until you can contact their parents. Furthermore, you and your church could go one step further and host a Trunk or Treat event at your church. This is where church members park their cars, open up the trunks (usually decorated with a fun fall theme), and give out candy. This establishes a presence within your community and makes people aware of the location of your church to everyone who visits, whether they ever come on a Sunday or not. Some churches give out cards with their service times and other pertinent information and slip them into each child’s bag. 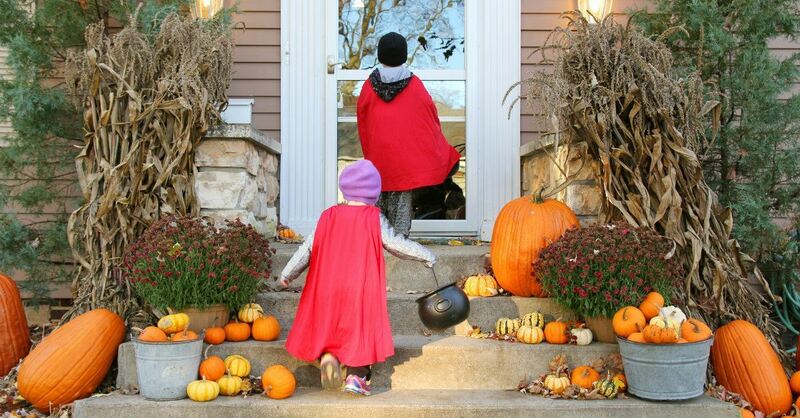 You never know: a child may decide to visit at a later date because of the kindness you showed them on Halloween.